Most amplifier circuits increase the amplitude of an input signal, producing an output signal which is a larger replica of the input signal. This section explores the basic principles of amplifier design, primarily using bipolar transistors. This guide concentrates on solid-state (bipolar transistor, FET, IC, etc.) amplifiers. While some tube amplifiers are in use even today, they are by far the exception, rather than the rule. Figure 1-1 shows the basic electrical connections for the correct biasing and normal operation of an npn transistor. While two volt age sources shown are here, most practical circuits don’t actually have two independent power supplies; voltage sources are illustrated separately here for convenience in our discussion. Later, you’ll learn how both of these biasing voltages can be obtained from a single power source. Fig. 1-1. The correct biasing for an npn transistor. Take careful notice of the polarities within this circuit. The base is more positive than the emitter, but negative with respect to the collector. The actual voltage applied to the base can either be positive or negative with respect to the common ground point, but the polarity relationships between the transistor’s various leads should always follow this pattern (unless you want the transistor to be cut off). The negative charge from the terminal connected to the emitter forces the spare electrons in the N-type semiconductor of the emitter section of the transistor towards the base region. The base- emitter PN junction is forward biased. The extra electrons can cross over into the base section, filling the holes of the P-type semiconductor. There are more electrons moving into the base region than there are available holes. (The base section is considerably smaller than either the emitter or collector sections of transistor.) Because the base region has more electrons than in its normal state, it acquires an overall negative charge that forces the excess electrons out of this portion of the transistor. A few of these electrons leave through the base lead to the positive terminal of the base-emitter battery, because the base lead is kept positive with respect to the emitter. The collector lead is even more positive, so most of the extra electrons are drawn out of the collector region, leaving it with a strong positive charge. This pulls most of the free electrons out of the base and into the collector, where they are drained off into the positive terminal of the base- collector battery. All of this is summed up in the names given to the sections of a transistor—the emitter emits electrons and the collector collects them. Just how much current is drawn by the emitter is determined by the characteristics of the specific transistor being used, and the amount of voltage being applied to the base terminal. You can adapt the basic circuit of Fig. 1-1 to apply a variable voltage to the base, as shown in Fig. 1-2. The setting of the potentiometer (R1) determines the amount of voltage fed to the base, which, in turn, determines the amount of current drawn by the transistor. Regardless of the amount of current drain, only about 5 percent flows through the base lead, while the remaining 95 percent flows out the collector lead and through the load resistance (R2). This theoretical circuit demonstrates that a very small change in the base current results in a very large change in the collector current. For this reason, transistors are often called current amplifiers. They amplify current, rather than voltage. Tubes, on the other hand, are voltage amplifiers. Of course, thanks to Ohm’s Law, the net effect is basically the same, since varying the current flow through the load resistance (R2), proportionately varies the voltage dropped across it. Fig. 1-2. Voltage applied to the base of a transistor controls collector current. Figure 1-3 shows a more sophisticated version of this type of circuit. Notice that there is only one voltage source in this version. Resistors R1, R2, and R3 form a voltage divider to tap off the appropriate voltages at the correct relative polarities for proper biasing of the transistor. If a very small ac voltage source is applied to the base, as shown here, the voltage on the base varies above and below its nominal dc value. This causes the collector current and thus the voltage dropped across the load resistance (R1) to vary in step with the ac voltage at the base. Because of the transistor’s current gain, the ac voltage across R1 is significantly larger than the original ac volt age applied to the base. In other words, the ac signal at the input is amplified at the output. Because the emitter in Fig. 1-3 is at common ground potential, this type of amplifier circuit is called a common-emitter amplifier. 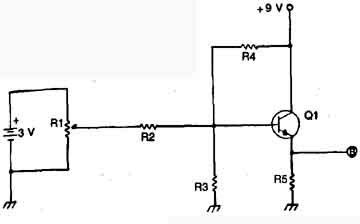 The emitter is used as the common reference point for both the input and output signals. Fig. 1-3. The basic circuit of Fig. 1-1 can be adapted for use with a single- ended power supply. In most practical common-emitter circuits, there is a resistor between the emitter and the actual common ground point. The resistor’s function is to improve the stability of the circuit. The emitter is still considered grounded. The common-emitter amplifier configuration exhibits a low input impedance and a high output impedance. Current gain, voltage gain, and power gain are all respectably high. Common-emitter amplifiers always invert the signal. The output is always 180 degrees out of phase with the input. In other words, when the input signal goes positive, the output signal goes negative. Fig. 1-4. An experimental common-emitter circuit. A common-emitter circuit is illustrated in Fig. 1-4. Breadboard this circuit, and you can perform the following experimental tests yourself. A parts list is given in Table 1-1. One lead of the voltmeter is left unconnected. If this lead is attached to point A, the meter displays the input voltage. If the lead is moved to point B, the output voltage will be indicated. Connect the free lead of the voltmeter to point A (input), and adjust the potentiometer until the input signal is exactly one volt. Now move the voltmeter lead to point B and carefully measure the output voltage without touching the potentiometer. Enter this value in the appropriate space in Table 1-2. Repeat this procedure for each of the input voltages listed in the table. When you are finished, examine the completed table carefully and notice how the output voltage varies in step with the input voltage. The common-emitter amplifier is the most commonly used type of basic transistor circuit, but other configurations can be useful in certain applications. Figure 1-5 shows a common-base amplifier circuit. Notice that the polarity relationships between the transistor leads remain the same as in the common-emitter configuration. The base is positive with respect to the emitter, but negative with respect to the collector. The base is grounded, so its nominal value is zero volts. The collector is at a positive voltage (above common ground), and the emitter is at a negative voltage (below common ground). The volt age drop across resistor R2 causes the voltage applied to the emitter to be below ground potential (0 volts). Resistor R3 and capacitor Cb are inserted between the actual base terminal and the ground point for stability. The values of these components are quite small to keep the voltage drop across them negligible. For all intents and purposes, the voltage applied to the base of the transistor is zero. The power gain of a common-base amplifier is slightly higher than that of a common-emitter amplifier using the same transistor, but the voltage gain is significantly lower for the common-base circuit. Fig. 1-5. A transistor can also be used in common-base configuration. Another important difference between these circuit configurations is their input and output impedances. Remember that power is transferred between circuits most efficiently if the impedances match. As already mentioned, the input impedance of a common- emitter amplifier is fairly low (typically between about 200 and 1000 ohms), and the output impedance is rather high (typically between about 10,000 to 100,000 ohms). The impedance of a common-base amplifier are similar, but the difference between the input and the output impedances are much more dramatic. The input impedance of a common-base amplifier is generally below 100 ohms, while the output impedance can be up to several hundred kilohms. Fig. 1-6. An experimental common-base circuit (Project #2). Repeat the procedure of the last experiment with a common- base amplifier circuit shown in Fig. 1-6. The parts list for this experiment is given in Table 1-3. Enter your results for this experiment into Table 1-4. As you probably have already guessed, the third transistor amplifier configuration uses a common-collector, as shown in Fig. 1-7. This circuit employs a positive ground point, so the operating voltages within the circuit are all negative. Table 1-3. Parts List for Project #2. Table 1-4. Worksheet for Project #2. The emitter is the most negative terminal. Resistor R1 drops some of this negative voltage so that the base is less negative (more positive) than the emitter, but it is still more negative than the collector. Thus the standard relative polarity requirements of the transistor are still met in this circuit. One of the unique features of the common-collector amplifier configuration is that the voltage gain is always negative; that is, the output voltage is less than the input voltage. There is some positive power gain in this type of circuit, but it is relatively small compared to the power gains of the common-base and common- emitter configurations. Fig. 1-7. The third basic transistor configuration is the common-collector circuit. For obvious reasons, the common-collector circuit doesn’t make a very good amplifier. It is quite a useful circuit for impedance matching applications. With the other basic transistor configurations, the input impedance is always lower than the output impedance. In the common-collector circuit, the relative impedances are reversed. The output impedance is lower than the input impedance. The output of a common-collector amplifier is in phase with its input signal. The difference between these three basic transistor circuit configurations are summarized in Table 1-5. Table 1-5: Identifying Characteristics of the Three Basic Transistor Configurations. OUTPUT IN PHASE WITH INPUT? The same experiment can be performed with the common- collector amplifier circuit of Fig. 1-8, using the parts listed in Table 1-6. Enter your results in Table 1-7. Fig. 1-8. An experimental common-collector circuit. Table 1-6. Parts List for Project #3. Each of these experiments uses only npn transistors. Similar results are obtained with a comparable npn transistor, but all polarities are reversed. Merely biasing a transistor at the quiescent operating point does not produce a functional circuit. The transistor must also be capable of amplifying an ac signal. Direct current amplification is fairly straightforward, but if you need to amplify an ac (time-varying) signal, a number of additional factors must be considered to create a functional amplifier circuit. Some parameters, such as the gain or beta (B), may change from their nominal dc value when ac signals are used. Circuit stability can become a problem, especially at higher frequencies. Several additional components must be added to a basic dc amplifier circuit to create a functional ac amplifier. These include a load resistor and several capacitors to prevent the ac signal from disturbing the dc bias voltages required for proper transistor operation. Figure 1-9 shows a simple common-emitter ac amplifier circuit. Notice the overall similarity between this circuit and the common- emitter de amplifier presented earlier. Besides the ac input signal source, just three components are added to the basic common- emitter circuit: capacitors C and C2, and load resistor R1. Resistance Rs represents the internal impedance of the input signal source itself. Fig. 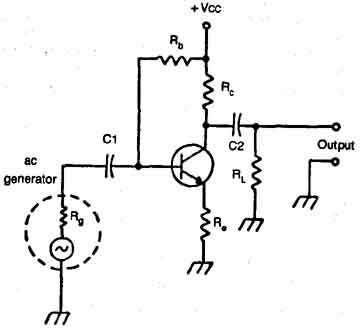 1-9.The basic common-emitter circuit can easily be modified into an ac amplifier. Capacitor C1 blocks the base bias current provided by Rb from flowing back into the signal source and flowing through Rg to ground. If that happened, the quiescent operating point of the circuit would be upset. C1’s value is normally fairly large so that ac input signals can pass through the capacitor to the base of the transistor for amplification. The amplified output signal appears across collector resistor Rc, and is fed to the output and load resistor R1 through capacitor C2. This capacitor blocks the dc collector voltage from reaching the output. 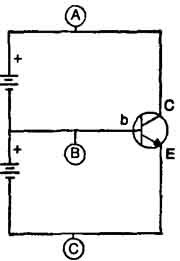 The amplified ac signal, however, passes through C2 to appear across load resistor R1. This also works in the opposite direction. If capacitor C2 is not included in the circuit, the ac output signal can throw off the dc bias applied to the collector. Resistor R1 represents the ac load on the output of the transistor. The output is the voltage across this resistor. R1 may not be an actual resistor in all circuits. It may represent the impedance of a loudspeaker, or the input impedance of an additional, amplifier stage, or another circuit. In a basic dc common-emitter amplifier, the output current is beta (Β) times the input current. A similar relationship exists in the ac version, but here we must work with ac beta, which may or may not be equal to the dc beta value. At other times, the Greek letter Β is used to indicate the same quantity. To prevent unnecessary confusion, dc Β is commonly written as Β dc. This convention is used throughout this guide. No subscript is used for ac Β, because it is a value normally used in design equations. 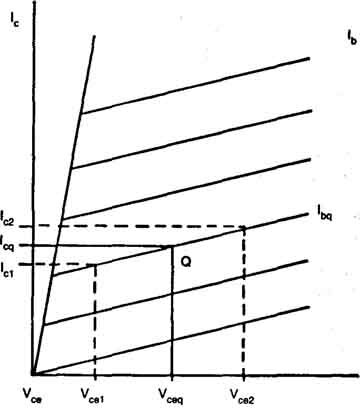 One practical way to find the value of ac Β is to use a set of characteristic curves, as shown in Fig. 1-10. The quiescent operating voltage (Vceq is selected, and the common point for the desired base current (IB3 in our example) and the appropriate collector current (IC3) in our example is found. This is marked as point Q in the diagram. When working with an ac amplifier, you also have to consider some differences in the emitter resistance. For a dc circuit, this was just a discrete resistor (RE) connected between the transistor’s emitter and ground. This resistor is the only resistance of importance in the dc circuit. But when an ac signal is amplified by the transistor, the internal resistance of the emitter itself becomes significant. This internal resistance is identified in the equations as re. The small r indicates that it is an internal resistance, rather than a discrete resistor. where I is the collector current in milliamperes and r is the internal emitter resistance in ohms. As with the dc circuit, the emitter resistance (R et) can be reflected back into the base circuit, where its value is multiplied by the ac beta. The internal collector resistance is dependent on the circuit configuration used. In a common-base circuit, r is the internal collector-to-base resistance of the transistor. For common-emitter and common-collector circuits, the internal collector-to-base resistance is called r d.
Fig. 1-11. A set of characteristic curves can also be used to find the ac collector resistance. 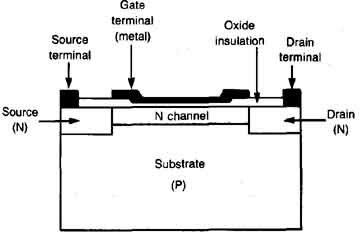 A transistor also has an internal base resistance. However, this resistance is usually quite small (typically between about 500 and 1000 ohms), and can reasonably be ignored in the majority of design equations. The internal impedance of the signal source (rg) and the base resistance (rb) are reflected from the input of the transistor to its output. Feedback is extremely important in establishing many circuit characteristics. In the simplest terms, feedback involves returning some of the output signal from a circuit back to the input of the circuit. Proper use of feedback can improve gain, bandwidth, and input and output impedances. On the other hand, feedback can cause circuit instability, clearly undesirable in an amplifier (although vital to an oscillator). 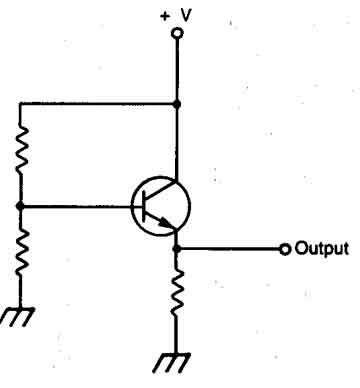 A signal that is fed back from the output of a circuit to its input so that the circuit’s gain is reduced is called negative feedback, Conversely, a signal that is fed back so that the circuit’s gain is increased, or so that the circuit breaks into oscillation, is called positive feedback. Fig. 1-12. Most practical amplifier circuits include a negative feedback loop. Af is the gain of the overall circuit with feedback. The denominator of the equation for Af ( 1 - bAv) is known as the feedback factor. When negative feedback is used, the expression bAv is negative, but when positive feedback is used, this term is positive. Assuming that the feedback is negative and bAv has a value much larger than 1, the gain of the amplifier is about equal to 1/b. Negative feedback makes the gain of an amplifier less sensitive to variations in the supply voltage or other circuit parameters. On the other hand, positive feedback makes the gain more sensitive to such variations. 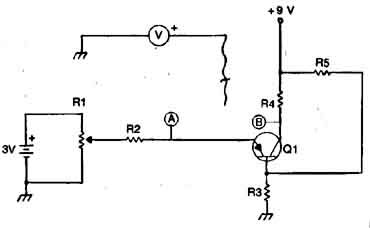 In this circuit, the feedback is applied in series with the original input signal, so the input impedance increases. The input impedance is increased by an amount that is directly proportional to the feedback factor. Conversely, the output impedance is reduced because the feedback signal is taken from across the load. The amount of this decrease is indirectly proportional to the feedback factor. Negative feedback has other significant effects on the operation of the circuit. For example, it reduces distortion and improves frequency response of an audio amplifier. Distortion with feedback is equal to the distortion without feedback divided by the feedback factor. In an amplifier with negative feedback, the high-frequency response is extended from Foh (the high frequency limit without feedback) to Fon (1 - bAv). Similarly, the low frequency response is extended from Fol (without feedback) to Fol/(1 - bAv). The first step in designing an amplifier with feedback is to determine the amount of overall gain required. Assume you need a circuit with a voltage gain of 40 dB, or Av = 100. Also assume that in this application, approximately 20 dB of negative feedback is needed to reduce the distortion to about 10 percent of what it would have been without feedback. In this case, the gain of the overall circuit should be 100 x 10 = 1000 to preserve the effective circuit gain of 100 once the feedback has been applied. If a resistor-capacitor network is included in the feedback path, the frequency response characteristics of the circuit can be altered. The RC network behaves as a filter. Even when only resistors are used in the feedback path, the feedback response is not uniform over the entire frequency band. The frequency response varies with the overall gain of the circuit, as well as with the capacitance, inductance, and resistance inherent in the different sections of the circuit. These do not have to be actual physical components. For example, there are several internal capacitances between the leads of a transistor. These capacitances are discussed in detail in Section 7. In an ideal amplifier, the waveshape of the output signal is an exact replica of the input signal. Only the amplitude is changed. However, electronic circuit is ever perfect. 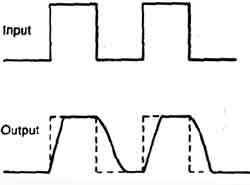 Any amplifier circuit alters the waveshape at the output. In very high quality amplifiers, the alteration may be virtually undetectable, but it still exists. This alteration of the waveshape is called distortion. There are many different types of distortion, but the most important type is harmonic distortion. In harmonic distortion, the circuitry adds additional frequency components to the output signal that are some multiple of some portion of the original input signal. 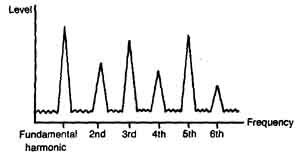 The sine wave is the only pure waveform with just a single frequency component (the fundamental). All other waveforms include one or more additional frequency components, which are generally harmonics, or whole number multiples of the fundamental frequency. The fundamental frequency defines the repetition rate of the waveshape. The harmonic series continues indefinitely. As a general rule of thumb, the lower harmonics tend to be stronger and more significant than higher harmonics. Not every complex waveform contains all possible harmonics. For example, symmetrical waveforms, such as the triangle wave and the square wave, contain no even harmonics, only the fundamental and odd harmonics. Non-symmetrical waveforms, such as rectangle waves and sawtooth waves, may contain a combination of odd and even harmonics along with the fundamental. 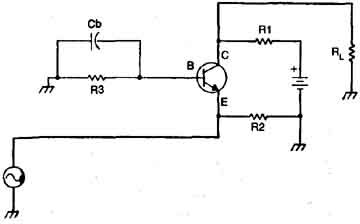 Any amplifier circuit tends to add to the harmonic content of the signal passing through it. The output can contain spurious frequency components not present in the original input signal. This is known as harmonic distortion. How much harmonic distortion an amplifier produces is indicated in a percentage specification called THD (Total Harmonic Distortion). The lower the percent age THD, the more distortion free the amplifier is. Negative feedback can significantly reduce the THD of an amplifier. The lower harmonics are especially reduced by negative feedback. This is convenient, since they tend to be the most objectionable. High order harmonics are generally very weak, and can pass unnoticed. Often, the upper harmonics may be outside the audible range, making them totally insignificant in an audio amplifier. If two or more separate musical waveforms are simultaneously passed through an amplifier, they tend to interact. The result of this interaction is called Intermodulation Distortion, or IM. Other types of distortion also exist, but they are usually less of a problem than harmonic distortion. Various types of distortion, and methods of dealing with them, are presented throughout this guide. Another important specification for determining the quality of an amplifier is the Signal-to-Noise ratio, usually abbreviated as SIN ratio. Any practical amplifier circuit generates some random noise. The S/N ratio defines the relative amplitudes of the desired signal and the undesired noise. If you stretch the definition of distortion slightly and define it as the presence of any signal in the output that is not present at the input, then noise is a form of distortion. Where harmonic and intermodulation distortion are made up of discrete identifiable freqUen0es noise usually contains varying amounts of random frequencies. (There are some exceptions, such as 60 Hz, hum. Obviously for an audio amplifier, any noise that is outside the audible spectrum (below approximately 20 Hz or above about 20 kHz) is of no particular concern, since it is inaudible. In the past, noise measurements were normally made with low- pass and high-pass filters having cutoff points that eliminated the effects of any inaudible noise frequencies. It was soon discovered that just measuring the total noise content wasn’t informative enough. Two amplifiers with same S/N rating could sound very different in terms of noise, the result of different concentrations of noise frequencies and the use of different weighting networks in making the noise measurements. A weighting network is necessary for meaningful S/N measurements, because humans do not hear all frequencies at the same audible level when all frequencies are reproduced at an equal measured intensity. Two signals with the same amplitude but different frequencies won’t sound equally loud. Human ears tend to be less sensitive to frequencies at either end of the audible spectrum. Extreme bass and very high tones don’t sound as loud as mid-range tones at a comparable amplitude. This is especially true at low listening levels. Since even in a moderate hi-fi system, the noise is reproduced at very low levels, it’s clear that the non-linear response of the human ear plays an important role in evaluating the annoyance factor of noise. Some types of noise are more objectionable than others. 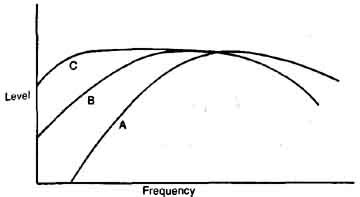 To measure this nonlinearity in the frequency response of the human ear, the Fletcher-Munson curves were devised. To compensate for these effects, three standard weighting networks have been devised for noise measurements. The standardization was made by the American National Standards Institute (ANSI). The standardized weighting networks are called simply class A, B, and C weighting. To measure the internal noise of an amplifier, a reference output level is first defined by applying some known input to the device. In many cases, the rated output of the amplifier being tested is used for this reference output level. The next step is to remove the signal from the input. The input is now grounded, and one of the weighting networks is inserted between the output and an average-reading ac voltmeter, as illustrated in Fig. 1-13. If the network has an insertion loss, this should be taken into account when the noise reading is taken. The noise level is read from the voltmeter as “so many dB below the reference output.” For a complete and truly meaningful specification, the type of weighting used should be identified. Fig. 1-13. 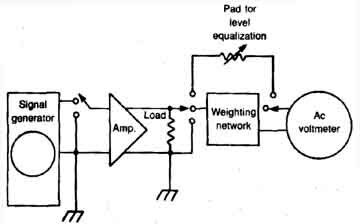 To measure noise, a weighting network is placed between the amplifier’s output and an ac voltmeter. The C weighing network has a frequency response with a continuous rolloff above 10 kHz and below 20 Hz. The rolloff rate is 6 dB per octave or more. The B weighting network is quite similar to the C network, but the B network also has a simple high-pass network (filter) having its half-power ( dB) point at 160 Hz. In the A weighting network; the frequency response of the C network is changed by the same amount as two simple identical non-isolated RC high-pass networks (filters) in cascade. Each of these has its half power -3 dB) point at 280 Hz. The frequency response of each of the three standardized weighting networks is shown in the plot of Fig. 1-14. Fig. 1-14. A standard weighting network uses a non-flat frequency response to better correspond to the way the human ear hears different frequencies. According to several psychoacoustic studies over the last few years, the so-called “annoyance factor” of noise does not necessarily correspond with the “equal loudness” curves of the older Fletcher- Munson studies. A more recent DIN network has been developed which differs somewhat from the standard A weighting network in that it includes a sharp cut-off filter above 9 kHz. Additional changes in noise measurement have become necessary with the improved frequency response of modem hi-fi equipment. Older audio equipment generally cut-off frequency component above about 12 kHz to 15 kHz. The bandwidth of more modern audio devices has been extended to well beyond 15 kHz. High frequency noise is of more concern to today’s audiophiles, so a “correct” weighting network (corresponding to annoyance factor) should take extreme high-frequency noise into account. The CCIR weighting network, shown in Fig. 1-15, is a popular choice for modern noise measurements. Fig. 1-15. One common form of weighting uses the CCIR network. Most modem electronic equipment is solid-state; that is, the active components are transistors or ICs. However, in certain audiophile circles, tube-based equipment has made a minor but significant comeback. Why is this? Many audiophiles hear audible differences between tube and transistor amplifiers, even with similar specifications. The “tube sound” is generally considered warmer and more pleasing. This is primarily due to the manner in which bipolar transistors operate, which can lead to the generation of high-order odd harmonics. This can occur even at signal levels below clipping, as illustrated in Fig. 1-16. Fig. 1-16. Transistors tend to generate high-order odd harmonics. These high-order harmonics tend to be more disturbing to listeners than lower-order harmonics. Of two amplifiers with the same THD rating, the one with stronger high-order harmonics will have a more objectionable sound. Whenever a signal overloads an amplifier, the way in which bipolar transistors exhibit clipping results in sharp, squared-off signals as shown in Fig. 1-17. Not surprisingly such clipped signals contain large amounts of high- order harmonic distortion. Fig. 1-17. Transistor clipping results in sharp squared-off signals. Tube and transistor amplifiers can also be distinguished in their transient response. Conventional bipolar transistors exhibit what is known as the carrier-storage effect. Imagine that the bipolar transistors in an amplifier are a series of storage tanks of unequal capacity with a valve to shut off the flow. The output flow is regulated by the valve. Even if the valve is fully closed, isolating tank I from tank 2, output current continues to flow until tank 2 is fully drained into tank 3. This carrier-storage effect limits the rise and fall times of high-frequency transient signals. Even though the bandwidth of a circuit may extend far beyond the highest desired frequency, high frequency square waves may be distorted, as shown in Fig. 1-18. Fig. 1-18. The carrier storage effect alters a square wave. The carrier-storage time is the interval between the beginning of the turn-off signal applied to the base of a saturated transistor and the instant that the collector voltage starts to rise toward the supply voltage. The carrier storage effect does not occur with tubes or FETs. While bipolar transistors are the most common, there are a variety of other transistors. The FET, or Field Effect Transistor, is particularly important because its operation more closely resembles that of tube circuits than does the operation of bipolar transistors. Transistors are current amplifiers, while FETs, like tubes, are voltage amplifiers. In other words, a bipolar transistor uses the input current to control the output current, while a FET uses a change in the input voltage to control the output current. Using an input voltage rather than an input current has a number of advantages that make the FET well-suited for use in audio amplifiers if it can produce a sufficiently high output current. The carrier-storage effect exhibited by bipolar transistors is not present with FETs. Practical circuits using FETs are not really all that different from those using standard bipolar transistors. A FET has a much higher input impedance than a bipolar transistor. This means the FET does not contribute substantially to the load on a preceding stage, but the various capacitances within the FET itself can effect the load. The load for a FET amplifier stage can change the resonant frequency, when it is a tank circuit. Internal capacitances and their effects are most significant at higher operating frequencies. This subject is addressed more fully in connection with rf amplifiers in Section 7. A bipolar transistor exhibits a direct relationship between temperature and current flow. If the temperature is raised, so is the amount of current flowing through the transistor. The more current flowing through any device, the hotter that device will become. This relationship can lead to a serious problem known as thermal runaway. Suppose that for some reason, the transistor starts to draw a little too much current. This causes it to run hotter, forcing it to draw still more current, heating it up even more. This feedback like cycle can continue until the transistor literally destroys itself. Special protection circuitry must be added to any power amplifier designed around bipolar transistors to avoid thermal runaway problems. FETs, on the other hand, are immune to thermal runaway problems. The FET exhibits an inverse relationship between temperature and current flow. As the temperature increases, the FET draws less, rather than more, current. Consequently, a FET amplifier is essentially self-protecting. Bipolar transistors are linear only up to a point. Any increase in voltage beyond a specific level produces no further increase in the output current. This condition is called saturation. FETs show no saturation in high-current operation. As the input voltage increases, the output current increases. This is quite similar to what happens in a triode tube circuit. In light of all of these advantages, why aren’t FETs used in all amplifiers? The unfortunate fact is that most power amplifier applications are just too much for the average FET to cope with. Ordinary FETs just can’t handle high currents. When the regulating input voltage is high the output current is limited and the device exhibits cut-off. This means that, as a rule, standard FETs are generally limited to voltage amplifying applications (such as rf amplifiers and low-level audio preamplifier stages) where the current flow is in the milliampere range. Electronics is a field of constant change, and this situation has been altered somewhat in recent years with the development of newer, improved FET-like devices. In 1971, one solution to the FET power problem was created by Professor Nishizawa of Tohoku university. He obtained high output currents from a FET by drastically changing its internal structure. 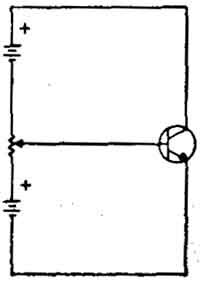 Nishizawa’s invention was called the VFET, or Vertical FET. In a VFET, the passage of current is still controlled by the input voltage applied to the gate, but the shape of the constriction is changed to permit higher current output, even with a high voltage input. The gate in a VFET has a comb-like structure that permits the current to pass through an infinite number of paths instead of the single path. To get an idea of the differences between a standard FET and a VFET, compare the construction of a standard PET (Fig. 1-19) with the construction of a VFET (Fig. 1-20). Fig. 1-19. In a standard FET the current flows laterally. Fig. 1-20. In a V-FET the current flows vertically. In a standard, small-signal FET the current flows laterally or horizontally. 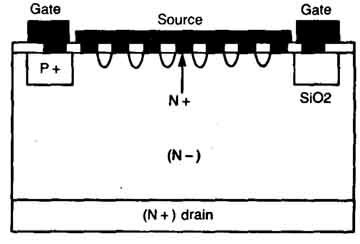 In a VFET, however, current can flow vertically from source to drain. A vertical current path has far greater current capacity and provides for a lower output resistance than a comparable horizontal current path. The current is controlled by the input voltage applied to the grid-like P + gate(s). The VFET does have a minor disadvantage in terms of size. The chip of a typical VFET is 3 mm square, while a typical small- signal FET chip measures only about 0.7 mm square. A VFET’s operation is very linear, which means that only small amounts of negative feedback are needed for wideband frequency response and a higher degree of stability. Here are a couple of practical general purpose amplifier circuits that can be used in many non-critical and low-power applications. 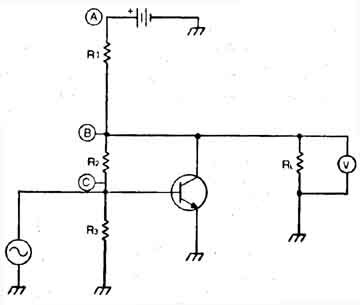 The first of these circuits (Fig. 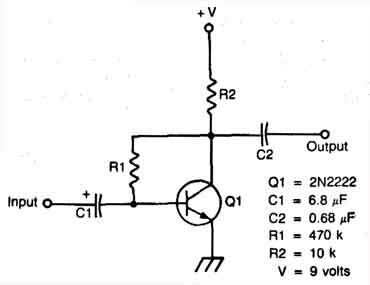 1-21), is a simple single transistor amplifier. This circuit can be used to boost almost any signal in the microvolt range. This is a very simple project that consists of so few components that it can actually be constructed to take up less space on a PC board than an IC. Fig. 1-21. Project #4 is a simple single-transistor amplifier. Fig. 1-22. Digital gates can be used for analog amplification (Project #5). This circuit features a gain of about 100 with the component values indicated in the diagram. Its frequency response is reasonably flat across the full audio spectrum. Nothing in the design of this circuit is particularly critical. A wide range of substitutions in the component values can be made without significantly altering the circuit’s performance. The capacitor values are particularly flexible. They may be changed if you don’t happen to have the indicated values on hand. If your application calls for a lower gain, simply reduce the value of feedback resistor, Ri Transistor Qi can be almost any small signal high gain npn transistor. But remember, the selected transistor will have a major effect on the circuit gain. For example, a 2142222 transistor can be used but the circuit will then have a lower gain than if the 2N3391 shown is used. The second practical amplifier circuit is shown in Fig. 1-22. This circuit is rather unusual in that digital gates are employed for analog signal amplification. As you can see in the diagram, this amplifier circuit is comprised of three sections of a CMOS hex inverter (CD4049, or similar). This amplifier exhibits a very high input impedance and so it does not load down the signal source. Since CMOS devices are used here, this circuit can operate on a wide range of power-supply voltages, with high noise immunity. 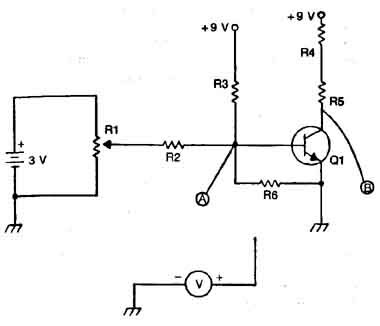 The gain of this circuit is determined entirely by the ratio of the feedback resistor value (R2) to the input resistor value (R1) The frequency response is primarily a function of the input capacitor. The output signal swings from ground to a level just below the supply rail. Unlike most linear amplifier circuits, this circuit’s output volt age won’t drop to ground potential when the input signal is removed. The output voltage always returns to V/2 (where V is the supply voltage) because we are using the digital inverters in a linear mode. This may or may not be a problem, depending on the specific application. If it does happen to be a problem in your particular application, you can correct it with a dc blocking capacitor at the output.